When I visited Zion National Park in 2011 one of the hikes that I absolutely loved was The Subway. 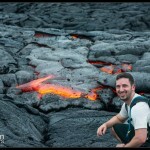 In fact, I went so far as to call it my most favorite hike I’ve ever done! Willie, Yan, and I had hiked the Narrows the day before and also found it to be equally amazing. Yan, having heard me raving about the Subway insisted that we head here on our second day in the park. I wanted to try something new, specifically hike to Kanarra Creek, but Willie and Yan convinced me that emerald pools and glowing walls would be worth it. The Subway it was! We arrived at the parking lot quite early and were shocked to see so many cars had already arrived! It was decided to see if we could pass *all* of them and we took off almost at a run at times. Other groups came and went in our wake as we flew up the Virgin River towards the Subway. About halfway through the hike I realized that our blistering pace was causing me to not enjoy the hike at all and I forced Willie to slow down so we could take in the scenery. This also gave us a chance to look back and realize that the clear skies we were hoping for were being covered with clouds â¦ not good for glowing walls in the Subway. On the other hand, it was perfect for photographing Archangel Falls located slightly before the Subway. Despite our fast pace to the Subway we were the second group to arrive. We had to wait for them to finish taking their pictures and then waited some more while they got out of ours. Turns out that waiting was well worth it because the clouds that had been blocking the beautiful glow inside the Subway disappeared for about 15 minutes and we frantically snapped photographs. 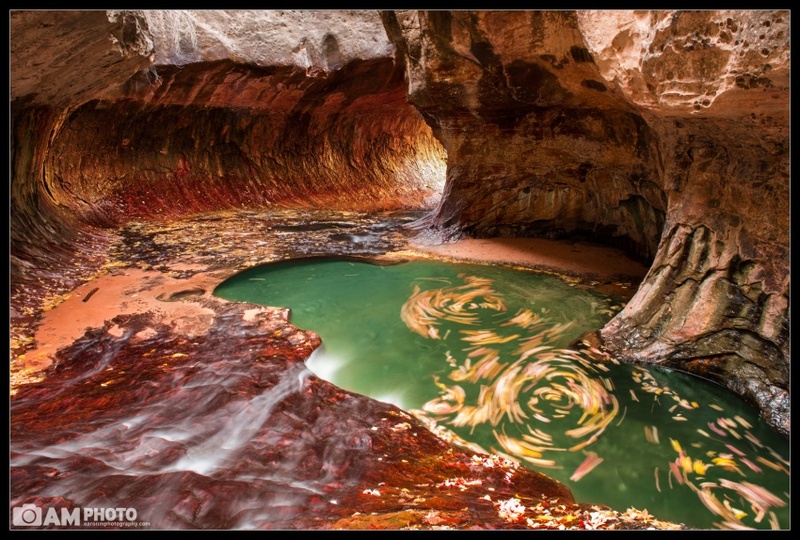 A flash flood 2 months earlier deposited sand inside the Subway and left the emerald pools looking yellow and boring. It took some ”special sauce” in post processing to bring back an emerald color to the pools. We brought a bag of leaves with us and were able to get beautiful some beautiful swirling motion in the water, which had eluded me when I photographed this in 2011.